NICE: "Informal but pulled together" or "casual elegant" are probably the best style profiles one can choose for the summer. A t-shirt under a jacket or blazer with a skirt, pants or knee-length shorts can be the outfit of choice for any office job. NO THANKS: Especially in the summer, many will dress too informally and then be caught embarrassingly underdressed when an unplanned meeting with an important client arises. I do know of some young execs who wear jeans and a tank top to the office during the summer and dress up if they have a meeting. In fact one young corporate type claims to keep a "suit" at the office specifically for such occasions. Comme vous voulez (as you want). NOTE-WORTHY: If you work in a professional office you need to be well-groomed and well put together. Designer head to toe is not recommended unless you are in the fashion industry. Bank employees, depending on who their clients are, need to be particularly mindful. If you are serving a couple worried about mortgage payments, you will dress differently than if your clients are corporate entities with nose-bleed high assets. NEED: Everyone needs a relatively simple blouse/shirt. In the summer, the tailored shirt can be replaced with a good quality dense cotton t-shirt. The fabric weight is important since you do not want a see-through gauzy fabric unless of course, you wear a simple camisole under it. But that just adds to the bulk, so go for an opaque finish and you will feel cooler. You can finish dressing in record time and you look more professional in a tailored shirt or blouse and pants, skirts or knee-length walking shorts. Even if it is casual Fridays, you need to look professional and a pencil skirt instead of pants or walking shorts accomplishes that. NECESSARY: A blazer is necessary. Everyone has a simple blouse/shirt and skirt, pants or walking shorts. You can finish the look and crossover to professional with the simple addition of a blazer. 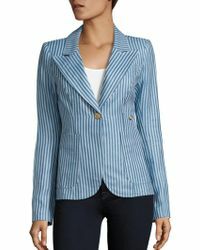 This Smythe blue-striped Duchess blazer would be perfect for the summer. It's on my wish list. You have a very nice collection of the office wears. We just started this business few years ago, you can have a look at our collection of premium clothing for women.